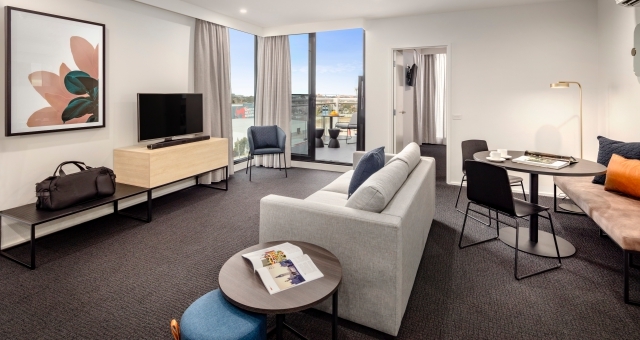 Apartment brand Quest Hotels had continued its suburban and regional apartment expansion, opening the doors to a new location in Maribyrnong in Melbourne’s north-west suburbs – the fourth in the rapidly growing area now home to over 6,500 businesses. The mix of one, two and three-bedroom apartments are set up primarily for business travellers and all feature equipped kitchen and laundry facilities as well as meeting rooms, an on-site gym and business lounge. Quest Maribyrnong features 78 apartment-style residences at 2 Wests Road, providing a link to the region’s commercial and industrial hubs of Laverton, Altona and Brooklyn. Franchisees Scott Orchard and Anand Sangwan say the heavy construction operations in the area will see new business sectors expand to the region, including stronger presences in healthcare and manufacturing. Highpoint Shopping Centre, Victoria University and multiple hospitals are all located nearby, as is Melbourne Airport, around 25 minutes away by car. Development is forecast to continue to transform the area, with up to 6,000 new homes courtesy of the forthcoming Maribyrnong Defence Site due to come online in the coming years. “Quest Maribyrnong is well placed to provide much needed short and long term accommodation in the area,” Sangwan commented.